One of the most written about, and photographed Victorian houses in California, and perhaps in the United States, the William Carson Mansion epitomizes the range of possibilities for eclectic design expression that created a peculiarly American style of architecture. Derived from many sources, but unique enough to represent none predominately, this much discussed and debated property stands today in virtually the same condition as when first constructed. 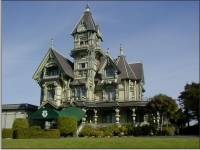 The designers, Samuel and Joseph Newsom, were well respected San Francisco architects who heartily embraced the concept of the “picturesque”, a quality that continues to fascinate all who see the Carson Mansion’s intricately composed interiors and exteriors. Prominently sited [143 M Street], the extensive grounds provide a substantial pedestal for this sculptured edifice. Eye-seeking and shadow-producing surfaces showcase the use of wood as a building material. This three-dimensional “pattern-book” took over one hundred men over two years to construct. Its influence on the design of subsequent buildings in Eureka is readily apparent even today. In addition to the abundant use of redwood, Mr. Carson imported 97,000 feet of primavera or “white mahogany” from Central America, along with other woods and onyx from the Philippines, East India, and Mexico. The elaborate interiors include stained glass, plasterwork, and carved ornaments in exotic woods. The Carson Mansion was owned by the descendents of William Carson until 1950, when it was sold to the Ingomar Club.